There are over 60 different varieties of Lilly Pilly in Australia. Syzygium australe is endemic to this area of the Mid-north Coast. 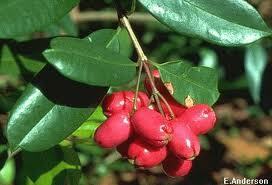 Syzygium australe grow up to 35m and make excellent screens, windbreaks or hedges, as they respond well to pruning. Their root systems are non-invasive and with their fast growth, a spectacular ornamental tree. The leaves are glossy and about 4-8cm long. The clusters of white flowers are followed by the dark pink to red fruits which are well suited to preserving as they are high in acid and set well in their own pectin. Eaten raw their soft juicy flesh is quite delicious – the skin has a slightly bitter after palate. The Coffs Harbour Beautification Improvements Committee in 1992 made a recommendation to Coffs Harbour City Council to adopt this indigenous Lilly Pilli as the floral emblem of Coffs. This recommendation was referred to the Garden Club and The Friends of the Botanic Garden where both approved and it was adopted by the Coffs Harbour City Council in July of that year. Weigula, from this native word came the name Woolgoolga - a town to the north of Coffs Harbour.